This may have been out for as much as two weeks, but I haven't read about it anywhere. 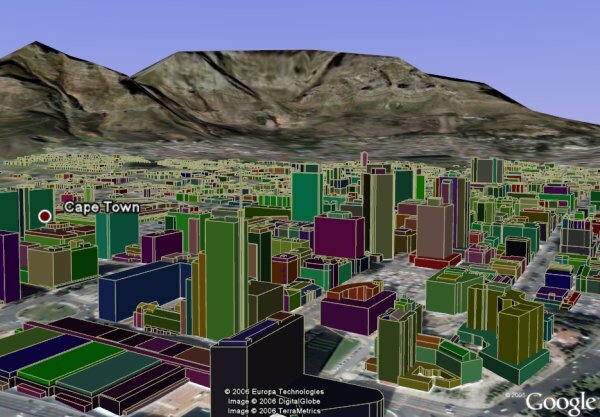 If you are a Google Earth developer, Google has released a KML 2.1 Tutorial. 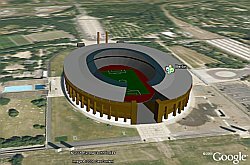 This is part of the June 12th announcements where they released Google Earth 4 Beta which supports the new features in KML 2.1. Just a sample of the new features are: Texture maps in 3D models, level of detail regions (so you can control detail on aerial photos (or other information) as the user zooms in/out), more efficient network links, radio button folders (allow multiple views of the same scene), and more. If you are a developer, this tutorial might give you more insight on the things you can do. Brian Flood also recently wrote a summary of some of the new KML 2.1 features. 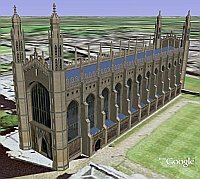 Another excellent 3D model is the Kings College Chapel in Cambridge, England (3.7MBytes - GE 4 only). This model combines good geometric 3D detail with carefully done textures. It was developed and posted at the Google Earth Community by someone called 'barnabu'. 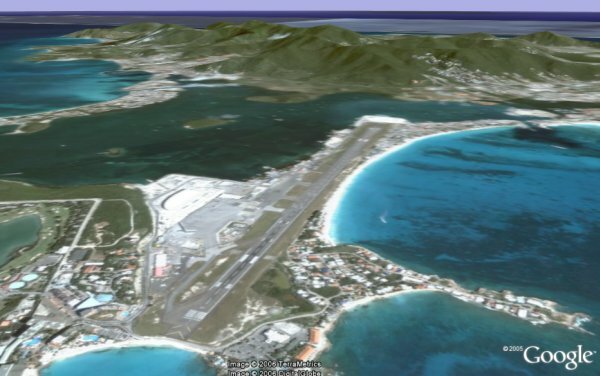 During the Google Geo Developer Day, the Google Earth team illustrated the power of the Google Earth resolution by showing this high resolution aerial photo of an airport. You look at this and say "OK, what's so high res about that?". Well, if you look closely below the airplanes in the lower center, you will notice what looks suddenly like huge people walking by. What you are really seeing are normal sized people walking by part of a miniature version of Holland which is a tourist attraction called Madurodam in The Hague, Netherlands. Check it out in Google Earth . 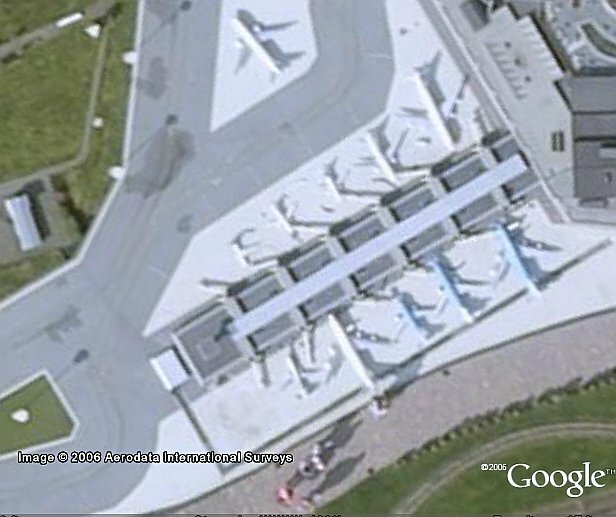 This Google Earth aerial imagery is probably about 3-6 inches per pixel based on other similar photos. Amazing! Brian Flood, author of the Arc2Earth extension for ArcGIS, has written an excellent white paper describing the new features and some possible applications of the new KML 2.1 in combination with GE4. In his write-up about the new texture mapping, he describes a live updating texture of a stock graph shown on the side of a building. Could this mean we might start seeing animated textures, or even video? Brian also describes the new feature which allows replicated models without requiring a huge KML file. 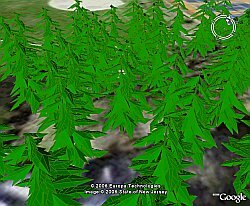 This means you could create a forest of trees with just one tree model. In my opinion, the most interesting new feature Brian describes is new KML functionality allowing more efficient network links. In the past it was necessary to reload all data for each update of a live network link. It is now possible to selectively update only the data needed. This should greatly enhance future live network link applications! 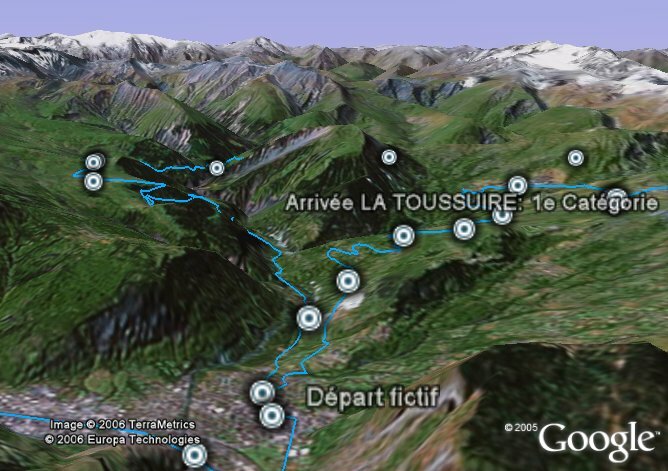 One aspect to enhancing the experience in Google Earth is the element of 3D for the terrain. I'm still surprised how many people don't realize you can pan/tilt your view in hilly areas and, if you have the "Terrain" layer turned on, you can see the hills, valleys, and mountains you might expect in Google Earth. 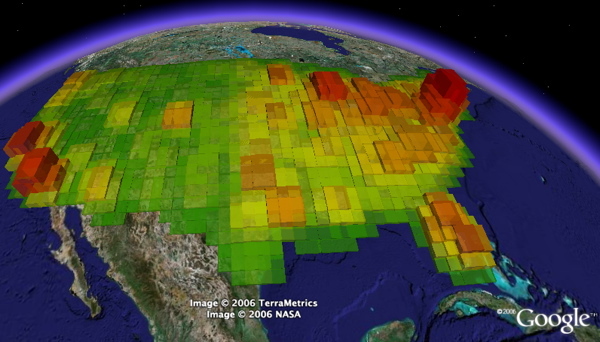 And, then there are the basic 3D "Buildings" layer Google provides for 38 metropolitan areas in the US. But, the buildings are just crude grey "blocks" which give you a feel for the layout of buildings in a city. Portion of Golden Colorado with textures (10 Mbytes) - by Chris Haller - see his blog entry. He concentrated on the front facing street-level views of these models with the textures. 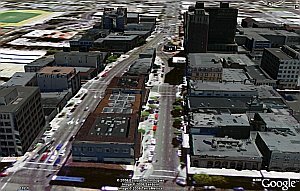 Twelve Blocks of Berkeley, California - This is part of a project to auto-generate 3D buildings from pictures, and they have now released this Google Earth demonstration. It looks excellent from helicopter distances, but the models look a little crude when viewed close-up. Very interesting stuff! 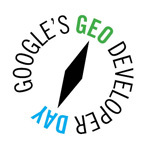 You can watch a video of the Google Geo Developer Day announcements here thanks to Google Video. This includes the major announcements made at the Googleplex on June 12th. This video also includes the showcase presentations by Mike Pegg of GoogleMapsMania, and by myself of Google Earth Blog. Thanks to GEC's PhilVerney for pointing this out to me. Valery Hronusov from Russia's Academy of Science has been busily producing all kinds of new things again: He has released KMLer 1.2, an extension for creating visualizations from ESRI's ArcGIS software, which includes support for the recently released KLM 2.1 specification (including level of detail). Valery has also discovered you can drag and drop or select multiple KML/KMZ files to open in the CTRL-O/open window for GE V4. And finally, Valery and his associates have produced a fantastic collection of aviation related information including airways, navigation points, and airspaces for the entire world. I will be doing a special write-up on this one soon. Recently Google Books created a dedicated web site to the works of Shakespeare which includes the complete plays available for viewing online. It also includes links to Google searches in the Google Images, Scholar, Groups, and News. They even mention that if you download Google Earth you can find the famous location in England where Shakespeare's original plays took place - the Globe Theater, as well as a model of the theater. But, they don't provide a link to the model. You can find the Globe Theater in the 3D Warehouse here. 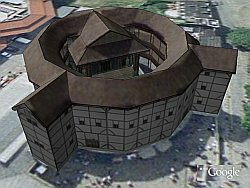 (NOTE: if you have installed the new Google Earth V4 beta, download the V4 model of the Globe Theater which has textures - this makes it look more realistic). If you look at the location without the model you can see there is a real replica of the building in the aerial photo of the location and lots of tourists checking it out. There is also an excellent collection of placemarks showing the places quoted in Shakespeare's plays which I wrote about last fall. The huge database update for Google Earth, which was first reported here at Google Earth Blog on 9-June, has now migrated to the Google Maps! At the Google Geo Developer Day, Google announced that this database update included nearly 4 times the amount of aerial/satellite photos, and now covers 1/3 of the world's population. Here's Google's official announcement on the new data. So, if your house wasn't previously found in Google Earth/Maps, you might want to check again! See also story at GoogleMapsMania. 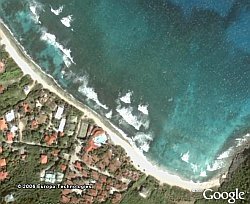 Here's the location in the photo of Simpson Bay, St. Martin viewable in Google Earth or in Google Maps. From my original story, here's some of the places updated: Russia, China, Africa, Taiwan, USA, Canada, Bermuda, the Caribbean Islands, many islands in the Pacific, Puerto Rico, South America, New Zealand, Australia, etc., etc. 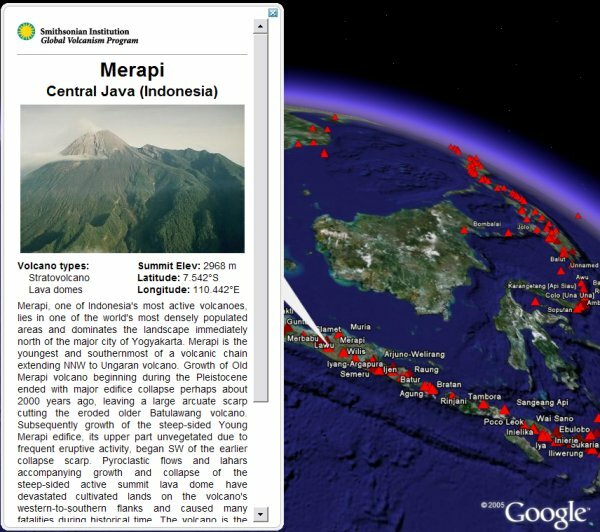 A month ago I wrote about an excellent placemark collection on global volcanoes from the Smithsonian Institution. Well, Google thought it was good enough that they have now included this collection as a default layer in Google Earth (this was part of the new layers which were updated on June 11). In your "Layers", open the "Geographic Features" folder and turn on "Volcanoes". You will get red volcano placemarks. When you click on the placemark you get excellent descriptions and photos for each volcano. You can also use the pan/tilt option in Google Earth and look at the satellite/aerial photos on top of the 3D mountain terrain (assuming you have the "Terrain" layer turned on). 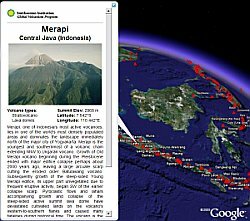 My friends at GoogleSightSeeing.com have declared today their second annual Volcano Day. They have several interesting places to look. 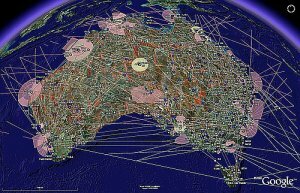 La historia de ayer sobre Ayers Rock en Australia me ayudó a dar cuenta (gracias a algunos comentarios) de que hay una nueva característica en Google Earth V4. En la historia, mencionaba que el nivel de detalle del terreno era muy pobre para ver la forma real de Ayers Rock (o Uluru). 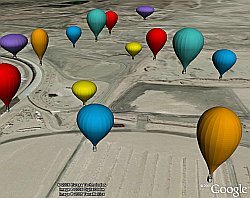 Dos comentarios señalaron que Google Earth V4 tiene una nueva opción en "Herramientas->Opciones->Vista" llamada "Calidad del Terreno". Deslizando el control hacia la derecha se incrementa la calidad del terreno. NOTA: esto quiere decir mejorar la vista del terreno 3D, NO la calidad de la imagen satelital/aérea del suelo. Lo malo de esto es que al tener más calidad de terreno 3D, más lento se hace el dibujo de pantalla. Si tienen mucha memoria en el sistema y una buena placa gráfica, probablemente encontrarán que subir a la máxima calidad de terreno no trae problemas de rendimiento. Sin embargo, si están viendo muchos modelos 3D con la calidad del terreno al máximo, quizás deban bajarla un poco para no perder rendimiento. 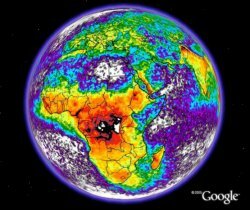 A few months ago, NASA released a high resolution map showing the annual flash rate of lightning colorized by frequency for the entire Earth. NASA has several satellites for studying lightning, some of which provide real-time data and images for researchers and for practical use. I know that pilots especially find lightning data useful for spotting areas of developing storm activity where we don't want to fly. Naturally, as soon as I saw the map, it occurred to me this would look better overlayed onto Google Earth. So, with a little bit of image cropping and overlay tweaking, I produced this annual lighning flash map overlay . Note, most intense levels are black or red. Youc an see a legend by clicking on the placemark "Annual Lightning Flash Map". You can also read NASA's scientific description of the annual flash rate map here with lots of interesting units of measurement. During the demonstrations at last week's Google Geo Developer Day one of the many new sights seen was Ayers Rock (or Uluru) in Australia which is now available in high resolution satellite photos. 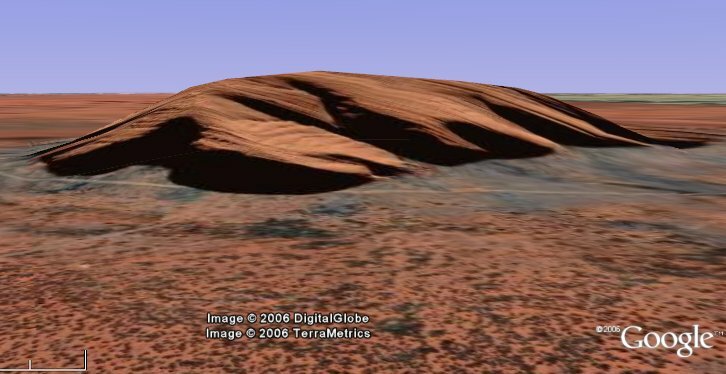 Since Google was kind enough to add 4 times as many places in high resolution on June 8th, it's inevitable there are many new places such as Ayers Rock now viewable in Google Earth. I'm expecting a flood of new interesting sights such as this in the coming weeks. Some people may notice the shape of the rock is not the same as in real life. 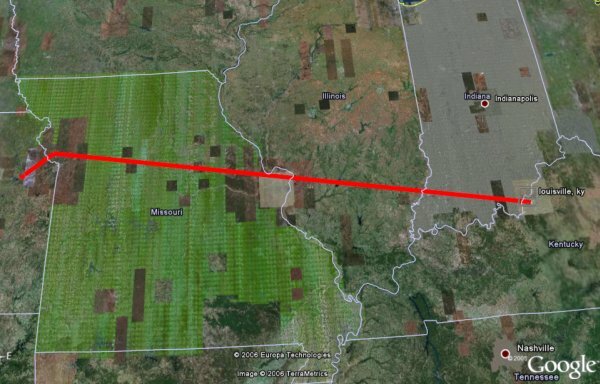 Keep in mind that the digital elevation model Google uses is based on data from NASA's space shuttle, and they have chosen to keep the data to a manageable size for computer memory to make sure as many users as possible can view the 3D data. If they used even higher resolution 3D terrain data it might slow down the experience too much for those with slower computers. It would be nice if there were a higher resolution terrian option for those with more horsepower. Now that Google Earth V4 is out with 3D model texture support, I expect many modelers will go back and add textures to enhance their models. A month ago I wrote about GEC member 'atf' having posted King Tut's Tomb with an innovative "floating" presentation by projecting the underground chambers above the spot where the chamber exists. The area where the tomb exists was updated with high resolution satellite photos as part of the recent huge database update by Google. And now, 'atf' has added some textures to the burial chamber so you can see the paintings on the wall of the chamber. 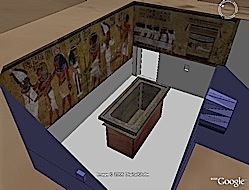 If you have installed Google Earth V4, Download King Tut's Tomb and make sure you open the folders in the "Places" pane so you can see the various views he has set up. Double click on each view until you get to the burial chamber where you will see the textures. You can download Google Earth V4 (beta) here. NASA World Wind put on a very impressive demonstration of their 3D browser, and it was a real crowd pleaser. They certainly have been very busy adding to, and improving, the application. They use the Blue Marble satellite photos, and real-time global cloudes for their high level views, which is something you can do with GE as well (Google should build this in by default). I was very impressed with the look and feel of the client, and especially liked the plug-ins for showing 3D Mars, 3D moon, and some deep sky stellar objects. During the Q&A they were asked about Celestia and indicated they would love to be "marry" Celestia with World Wind. Maybe NASA will start offering all the features in the commercial versions of GE soon and start competing with Google? I have to say the NASA World Wind web site is very professional. I've seen commercial software products which had worse-looking web sites. There's an organization called OSSIM.org (Open Source Software Image Map ) which apparently has some "Awesome Image Processing" tools. "OSSIM provides advanced geo-spatial image processing for remote sensing, photogrammetry, and Geographic Information Systems" - for free. The demo and the web site are pretty impressive. Maybe Google should look at this stuff to normalize and enhance the aerial/satellite photos they get from their data providers. Yahoo gave a presentation about Yahoo Local. I only took a couple of things away from this: they will have some new stuff in the next couple of months (no details given), and they now have a new blog to tell people about their activities (no URL given out). Kind of disapointing - although Microsoft didn't announce anything, they at least showed their major new features implemented only two weeks ago. I was told by someone at Where 2.0 that Microsoft's Virtual Earth team is on a 100 day upgrade cycle. So, the next major release for VE would be sometime in late Septemeber. ESRI's Jack Dangermond came up and spoke about his vision for the GIS/mapping future. As usual, he seems to have a good handle on the future of GIS. He had a couple of his people come up and demonstrate a number of things showing how ArcGIS GIS visualizations can be exported out to various mapping tools. Even a weird (why?) demo of sharing ArcGIS stuff via chat. Incidentally, Jack said ArcGIS 9.2, due out in September, will support some of the new features in KML 2.1, and in addition they will support the Virtual Earth markup languange(? - or whatever they will have for their API). Jack indicated they see themselves as mapping and virtual globe agnostic (meaning they will support any mapping or Geobrowser/virtual globe of note I guess). What I found most interesting was they didn't seem to mention, and did not demonstrate, ArcGIS explorer. But, they did run out of time before they were done. But, I expected ArcGIS Explorer would be up front and center. Will ArcGIS Explorer still be released? After the conference ended, Yahoo hosted a nice social hour with open bar and some food and music. I got to talk some more to the Tagzania guys, Panoramio's Eduardo Manchón, Brady Forrest (Co-chair of Where 2.0 and Chairman for next year), and quite a few other people with lesser degrees of Google Earth interest. Unfortunately, I missed meeting Tim O'Reilly, but I did watch him moderate a good panel session. He seems like a great guy. While at the Yahoo bash, I also had an interesting conversation with Mikel Maron, who is spearheading the GeoRSS development. We talked about GeoRSS and Google Earth's KML and his desire to see Google do more with GeoRSS. I suggested it might be better to get Google to make KML an open standard and implement elements of the still developing GeoRSS to make it easier for RSS folks to georeference. We both agreed that given the huge amount of competition between the big three (Microsoft, Yahoo, Google), it will be challenging to get everyone to agree. Where 2.0 was a well-attended, and very well-run conference. If you are in the web 2.0 mapping business, and the virtual globe business, I think this is probably one of the best conferences, if not the best, to attend. Hope this is interesting news for you. I'm pretty excited about the whole thing. During breakfast I saw a really classy thing - O'Reilly had a Where 1.0 map: a plain paper world map with a bunch of pushpins on a cork board. Yep, it was a really ironically pleasing thing to stick a real pushpin into a map to show where you came from to attend the conference. I'll post a picture later. Very fun! Microsoft's Steve Lawler, GM of Microsoft Virtual Earth gave his presentation in the first morning session. He started off by mentioning they had some significant new updates to the Windows Live Local in the previous two weeks. The new satellite photos in the UK, birds eye views in a few cities in the UK, street maps and directions in 30 countries now, and there new "collections" of pushpins feature. When Microsoft showed collections of push pins, it really seemed very weak (especially considering that there are many thousands of placemark KML collections - in fact nearly all of the ones Microsoft showed have already been done for months in GE). Steve did allude to how they are working hard to allow people to "fly" to earth destinations, and that Microsoft does in fact produce a pretty good flight simulator already. The point being they will be doing their own 3D globe. During the break I went to the exhibit hall. Google had a Google Earth booth showing the new version of GE and examples of texture mapped 3D models, and the new satellite photography. Skyline software (the guys who have been trying to sue Keyhole/Google were there with a booth showing their VERY similar-looking virtual globe. One thing I found interesting is they were demoing their virtual globe running within a browser window instead of as a separate application. ESRI was demoing ArcGIS, and of course ArcGIS Explorer in a booth near Google. I plan to get a demo of AGE tomorrow. I met Alan Glennon who does the Geography 2.0 - Virtual Globes blog, and had an enjoyable chat. Then it was time to go back to the sessions. Wait, that's not all, keep reading to see more. A little while later, John Hanke, GM of Google Earth at Google, and Brad Schell, GM of SketchUp at Google, got up and gave a presentation of the many things that were announced yesterday. But, they did an even better job showing them. They showed the new Google Earth V4, got nearly a standing ovation for supporting Mac with Universal Binary and Linux for both GE and Google SketchUp, they showed the significance and examples of the huge new database of aerial images, and Brad built a 3D building with textures with SketchUp and blew away the audience with how easy it was. The audience was quite enthusiastic. I had lunch with two of the guys doing Tagzania.com, which is a really great Google Maps mashup which also has great support for Google Earth. Their company is based in the Basque country in Europe, and so it was a real pleasure to get to meet them and see them attend this show. A little while later Brian McClendon, Director of Engineering of Google Earth at Google, and Lars Rasmussen (who is the guy who originally wrote Google Maps), gave a presentation of the new KML 2.1 and the ways KML can work with Google Maps now. I'm sure when all of these developers get their hands on these new features there will be some really great stuff to see. By the way, Jason Birch sent me an E-mail early this morning saying he has already developed a cool application which allows you to access ArcGIS WMS GIS servers convert them into KML 2.1 (use GE V4 to see) so you can see dynamic overlays of the data in Google Earth. At this point, I left the Where 2.0 conference because I was invited by Michael Jones (CTO of Google Earth at Google) to his house for a social gathering of Google Earth team members and the moderators of the Google Earth Community. The moderators are some great folks from all over the world who carefully monitor posts at the GEC to make sure things are posted in the right places, and to provide help to the many thousands of people who need help with the forums and Google Earth tips. Google flew them in so they could attend the big announcement and get a chance to meet face to face. Not only are they great people, but they all seem to be regular readers of Google Earth Blog and made me blush with their nice words about the work I've been doing. It was a thrill to sit down and talk and get to know these great guys and gals. Getting to meet some of the Google Earth team members was also a lot of fun as well, and even two of the top guys at SketchUp were there as well. The Google Earth folks look like a great team who are really careful and proud of their products and I know they will continue to work very hard to continuously improve their products. That's all for today. Look for more reports tomorrow! I already know one big thing I will be writing about tomorrow. John Hanke, General Manager of the Google Earth team, has written a blog entry for the Official Google Blog about the announcements made yesterday for the new Google Earth/Maps announcements. 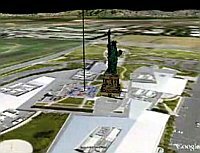 The blog entry has a number of example KMLs in celebration of the 1st anniversary of the release of Google Earth (a little early since it was the end of June 2005 when it was released). Some of the links point to stories written here at Google Earth Blog. 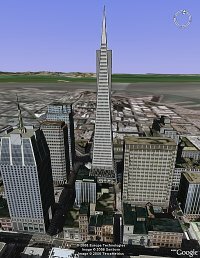 There are also links to downloading the new Google Earth V4, Google SketchUp, and the 3D warehouse. Make sure you check out the huge update to the Google Earth satellite photos. 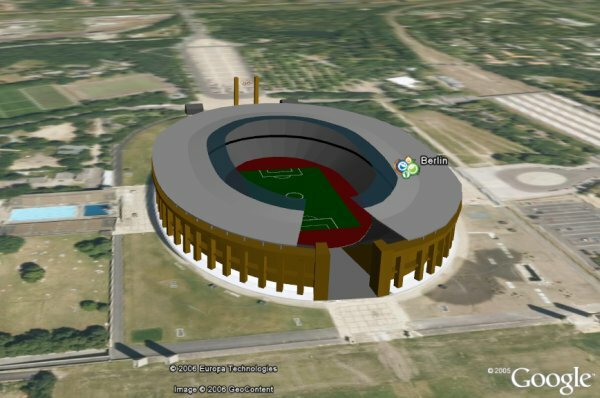 Yesterday, Google announced fantastic support for 3D models in the new Google Earth V4 (beta). 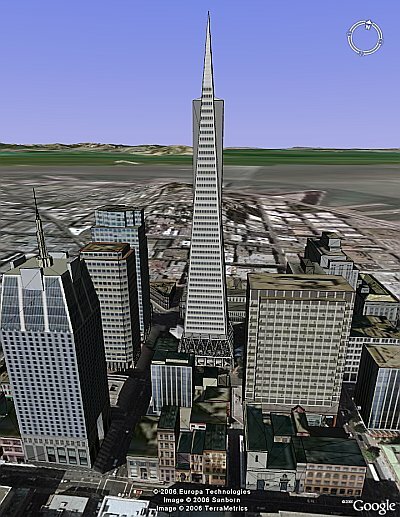 The 3D models for Google Earth will take on much greater realism now thanks to new support of textures. This means you can put color photos, patterns, even paintings onto the surface of polygons for 3D models. Models of buildings, people, landscapes, etc. will take on much greater realism without the necessity of complex 3D data which would otherwise take up a great deal of memory. This unleashes the full power of the free Google SketchUp modeling program. In addition, Google announced new versions of Google SketchUp for both Windows and the Mac OSX. Mac OSX support is new for SketchUp. Not only is the free version available for the Mac, but also SketchUp Pro 5 is also available for the Mac. 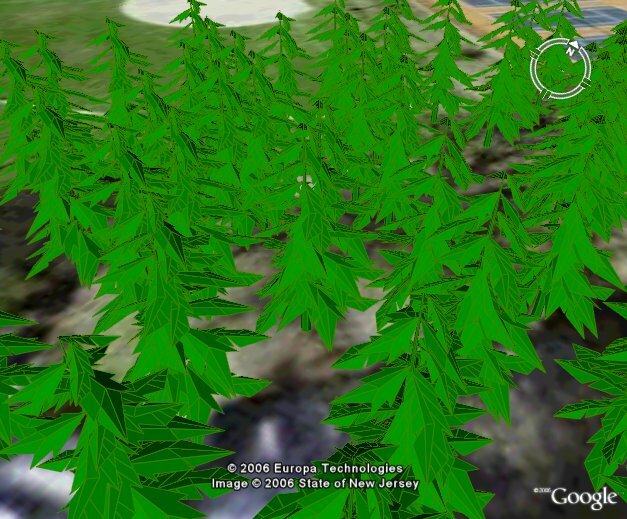 The Google 3D Warehouseis already being populated with 3D models supporting textures. Look for models with textures which are marked as downloadable by Google Earth V4. You can search for "San Francisco" to see a bunch of examples. The free Google SketchUp provides a simple mechanism for first importing a screenshot of the satellite/aerial photos for the location where you want to place your 3D models. And then, after you place your 3D model where you want it, you can easily export the model back to Google Earth. It's amazingly simple! As promised you can now download the presentation KML I used to present at the Google Geo Developer Day yesterday. Please note that due to time constraints, I was only able to show a small percentage of the over 500 amazing KMLs I've written about in the last 9 months. And, I was not even able to show all of the KMLs listed in this presentation. But, if you saw my presentation, you will at least be able to find the KMLs you may have been interested in. I would also encourage you to do a search on Google Earth Blog to find the write-ups on these KMLs. By the way, I also want to mention that I had a great time meeting and spending time with Mike Pegg - author of GoogleMapsMania. Mike presented a similar presentation focusing on applications of the Google Maps API and did an excellent job at the event. Reporting LIVE from Google Geo Developer Day in Mountain View, California. See the main announcement here. Google Maps now supports KML files. Not only can you give Google Maps the URL of a KML/KMZ file and have your placemarks displayed, but also even KML files with polygons and lines will be displayed as well. This is really AMAZING! KML has just become an even more important file format for sharing geolocation information as a standard. KML V2.1 is announced and supported by the new Google Earth and by Google Maps. KML 2.1 supports level of detailing for both placemarks (like has been done with Google Earth Community layers) and also for imagery. So, you can have increasingly detailed resolution imagery for an image overlay as you zoom in lower. This is really going to open up some exciting new applications. The HUGE new image database update I wrote about last Friday is actually even bigger than I realized. Google showed an amazing KML file showing just how big their high resolution data really is, and it just blew me away! (I hope to get a copy of that KML file). Here's some important statistics: they now cover 4 TIMES the amount of land surface. Now 1/3 of the world population is covered in high resolution. Amazing! By the way, turn on the new National Geographic Layers - they are now covering more than just Africa! Reporting LIVE from Google Geo Developer Day in Mountain View, California. Starting off the presentation at this launch was the three top figures at Google: Eric Schmidt, Larry Page, and Sergey Brin. From the presentation by John Hanke, general manager of Google Earth: Google Earth has been downloaded over 100 Million times since it was release a year ago. Today Google has released a new version of Google Earth - V4 (beta). This is the next generation of GE sporting a new look and feel, cleaner interface, and many new features. 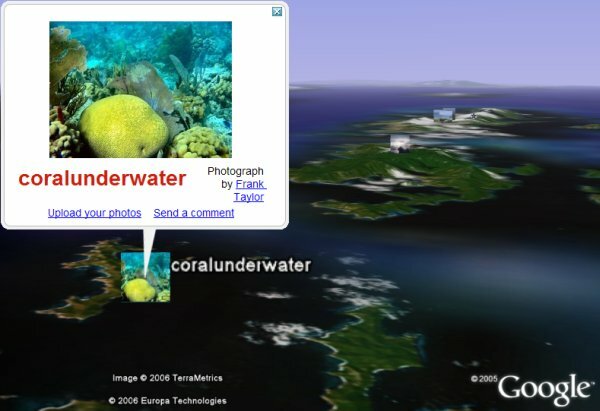 Download the new Google Earth V4 (beta) here. The 3D models for Google Earth will take on much greater realism now thanks to new support of textures. This means you can put color photos, patterns, even paintings onto the surface of polygons for 3D models. Models of buildings, people, landscapes, etc. will take on much greater realism without the necessity of complex 3D data which would otherwise take up a great deal of memory. This unleashes the full power of the free Google SketchUp modeling program. There are other important announcements for the Google Maps API as well. I will report on these and other developments and the significance of these and other announcements later today. Read more details on the announcements. 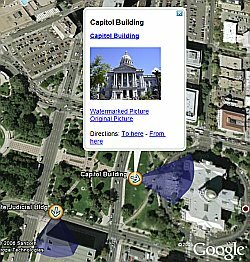 Google has begun introducing a new organization for the layers in Google Earth. I noticed the changes on the Windows version of GE, but the Mac version so far is still showing the normal layout for the layers. In the new layout things seem to be much better organized in a hierarchical fashion. For example, there is now a "Gas, Food, Lodging" layer. When you expand the layer folder you can now select Dining by type (Barbeque, Asian, Fast Food, Indian, Italian, Japenese, etc.) and layers for gas and lodging. The Google Earth Community layer is now broken down into many sub-categories which in many ways mirror the forum categories at the GEC. For example, Military, People and Cultures, Nature and Geography, History Illustrated, etc. There are now just a few primary layers, and you can expand the folders to see the full lists This is just another example of new updates which will be a part of the announcement at tomorrow's Google Geo Developer Day. A few days ago Google released a huge database update for the satellite photos in GE. Next week will be a big news week for Google Earth Blog. As has been reported, I will be attending the Where 2.0 conference which is a gathering of the makers and developers for 2.0 mapping technologies and Google Earth. Google, Microsoft, Yahoo, ESRI and all the big players in the new Internet mapping technologies are sponsoring and attending this show. In addition, Google is hosting a special invite-only Google Geo Developer Day to announce some new things for Google Maps and Google Earth, and to provide an opportunities for developers to meet with the Google teams which develop those applications. Google has also invited me to make a presentation, along with Mike Pegg of GoogleMapsMania, of a few of the more interesting applications for Google Earth and Google Maps. There will probably be many interesting new announcements, so check Google Earth Blog often all next week. I think yesterday's big release of new aerial photography for GE is just the beginning. Google made a HUGE update to the Google Earth satellite/aerial photos database late Thursday night June 8th (not yet available in Google Maps aerial database). There are now high resolution satellite photo data strips scattered all over the world where there were previously only lower resolution data. Now you will find strips of high resolution aerial photos for many towns, cities, and even rural areas in countries all over the world including Russia, China, Africa, Taiwan, USA, Canada, Bermuda, the Caribbean Islands, many islands in the Pacific, Puerto Rico, South America, New Zealand, Australia, etc., etc. Wow! It's going to take time to absorb just how fantastic this is. My favorite addition so far is the Caribbean islands - where they even include waters surrounding the islands so you can see sailboats at anchor (as a sailor of those areas it brought tears to my eyes!). The screenshot here is of St. Martin/Siint Maarten (two countries in one). Fly there now (or see it in Google Maps). Also, check out the Arecibo Radio Telescope (Google Maps) in Puerto Rico. Digg it! A special thanks to 'Cyclonic' at the Google Earth Community who alerted me to the update. Cyclonic manages the database of airplanes in flight which often is responsible for discovering new database updates. Early this year I wrote about Panoramio, which is a cool free photo sharing tool which was designed specifically to allow people uploading photos to tie them to a map (or Google Earth) location (see the story). Since then, Panoramio has grown significantly and has continued to refine its interface. In particular, developers Eduardo Manchón and Joaquín Cuenca wrote me recently to tell me about some very interesting enhancements to their photo upload interface. They didn't just try to improve the interface, but actually invented a better way to upload photos to web sites. The interface seems elegant, simple, and robust. You can read about the implementation in this blog entry. More importantly, you should try opening a free account with Panoramio and upload some photos. After you upload, you can then place where the photo belongs using a Google Maps interface. 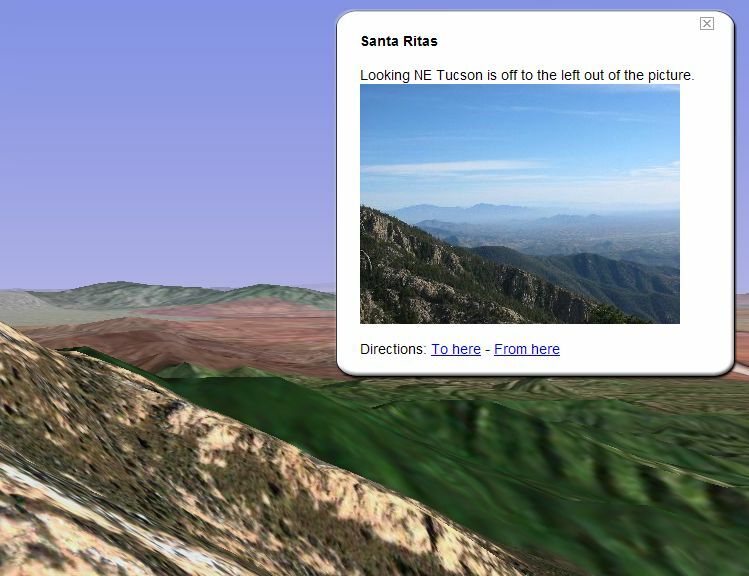 You can then view them in the Google Maps interface at Panoramio, or download the Panoramio GE network link and browse a world of photos on top of the aerial views in Google Earth. As you zoom into areas, photos for that area will appear as miniature icons. This is a handy way to do some sightseeing and worthy of a place in your My Places folder to turn on and off as you need it. Watch a GPS Phone Being Delivered via UPS Live! This is just amazingly cool! The guy who does Where's Tim (a web site which lets you track a guy who carries his phone around with him all the time) is delivering a phone to a friend. Tim turned the phone on when he dropped it off at the shipping office a little while ago, so you can watch the phone as it's being delivered right now! View the phone track by going to this Google Maps mashup. Select the "Get History" option to see the track in Google Maps where the phone has been today (it started off on 06/07/2006). You can then choose "View history in Google Earth" to see the track overlayed in the aerial photos of Google Earth. [Updated: the phone made it to Louisville, Kentucky before the battery apparently died last night.]. 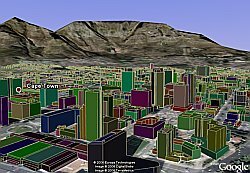 Last week I was contacted by the folks at Computamaps who have created a very nice collection of over 1000 buildings for the Cape Town area modeled in 3D. According to Steven True at Computamaps, the buildings are horizontally and vertically accurate to 1 meter. It works best with the "Terrain" layer turned on. They used SketchUp and SilverEye to make the building collection. SilverEye is the software by GeoTango (acquired by Microsoft last December) which lets you create 3D images from aerial photography. I especially like the fact they have chosen to make their building collection colorful (unlike the default built-in 3D buildings Google provides for big cities in the US). You can also read their post at the GEC. This collection will be even more popular in a few years when Cape Town hosts the 2010 World Cup. An interesting Google Earth network link for tracking an expedition has been posted for Project Thin Ice, by Greenpeace. The project is drawing attention to the danger to polar bears due to the melting of artic ice. 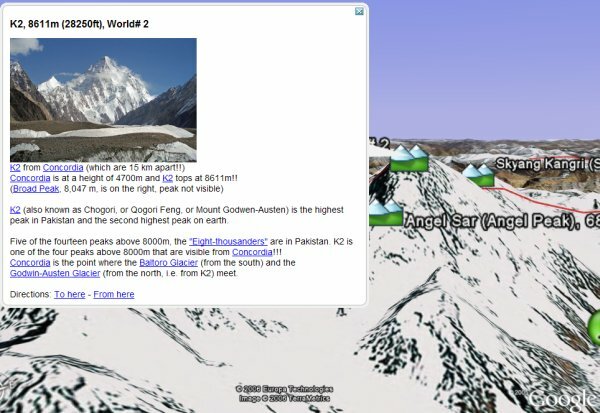 The web site includes a blog, videos, photos, maps, and now a Google Earth file for tracking the expedition. The GE file was done by Tim Harincar who also does Sailblogs.com I wrote about earlier. There is an image overlay of the estimated ice concentration added over the satellite photos of the area. I like the way the placemark descriptions provide a brief snippet of a blog entry with a link to the actual blog entry at the web site. Also, I like the way he has used the colored bubble descriptions to add the "green" for Greenpeace. (Read here for a story on how to make colored bubbles). Great work Tim! I thought about titling this story "Russians are Mining US Government Data!". But, I resisted. My friend Valery Hronusov in Russia has in fact been mining publiclly available US Government data again. 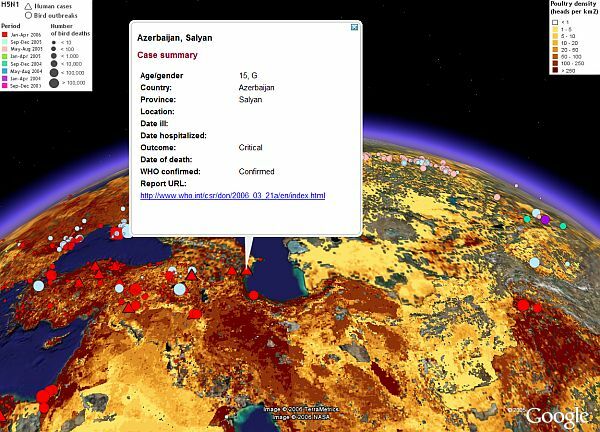 Valery is the author of a GIS visualization tool for Google Earth called KMLer. He has been producing a vast range of very interesting visualizations for months. Now, he has found some excellent data at the US FCC (Federal Communications Commission) wireless site. Shown here is the American communications objects density in a 3D graph. If you open the placemarks folder you can see there is a huge amount of data contained within the graph as "slides". In his post thread , Valery posts several other visualizations include cellular tower density , TV digital towers by state , and many more. 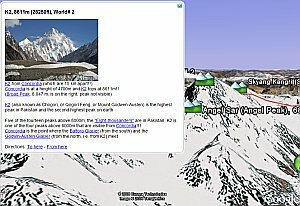 A big fan of the northern Pakistan mountain regions has put a lot of effort into documenting the area with a large collection of placemarks which include detailed descriptions. You will discover that the region is home to 5 peaks over 8000 meters in height, and over 100 over 7000 meters. Google Earth is an excellent resource for looking at this region when you use the pan/tilt features which let you view the satellite photos as they are draped over the 3D terrain. You will also find 3 glaciers each over 50 km long, and many other interesting facts. The placemark collection also shows camps for climbing expeditions, and documents many towns and villages all throughout the regions. You can turn on the borders layer and see how Google is now showing colored borders marking some of the disputed border areas. This collection was posted by someone called 'Waqas_' at the Google Earth Community. 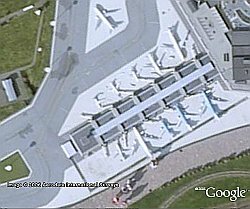 There have been a number of interesting places to see in Google Earth's satellite photos and 3D models posted recently, which I've been collecting for the weekend. Check through the list below for some fun. Drive-In Theaters - What better thing to do on a weekend than watch a movie at a drive-in? Drive-ins.com has a Google Earth file of the hard to find drive-in theaters. Use GE to find directions, but make sure the theater is still open. School Bus on Roof - The St. Louis City Museum looks like an interesting place. Any museum creative enough to stick a school bus hanging off the roof has got to be interesting. Osaka Dome - Osaka, Japan. This is an excellent 3D model of a complex building. Look at it from the side. Posted by 'barnabu'. make sure you see his photo of the actual building. Arecibo - Puerto Rico, this is the world's largest radio telescope. 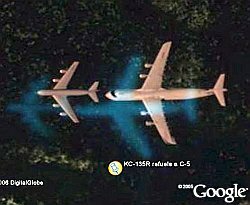 Also seen in the movie "Contact" and in James Bond movies. It's an awesome sight I've visited myself. Posted by 'GregTSL', he had to make his own custom version of the ground since the telescope is nestled in the mountains. Albuquerque International Balloon Fiesta - 3D models posted by jpwade. This is a beautiful event to behold. See some photos of the real events. National Theatre Brasilia - An interesting architectural delight in the capital of Brazil. Posted by 'pivnice'. Farmer's Huge Arse - That's right, a UK farmer has put up a huge arse, at least the word, in his field. For lots of other words visible in Google Earth's satellite photos, check out GoogleSightseeing's Large Type category. It had to happen eventually. GoogleMapsMania just found out about a new Google Maps mashup showing stripclub locations in the US. He pointed out they have a Google Earth version as well. This is nothing more than a collection of placemarks, but its interesting because this just shows the diversity of location information being added to GE. There's also a blog about the updates being made located here. I guess this could be useful if your planning or going to a bachelor party. PC World has just released it's 100 Best Products of the Year. The first software product listed (in position number six) is Google Earth. Interestingly, Windows Live Local is listed number 39, Yahoo Maps is listed number 56. But, Google Maps doesn't even make it on the list - which just doesn't seem right. PC World describes Google Earth as a "Satellite Mapping Service". Not the best description, but I'm glad to see Google Earth get even more accolades.